(KZN.RU, February 4, Alena Miroshnichenko). Energy saving measures are being actively implemented in various sectors of the urban economy in Kazan. Energy efficiency projects are being applied at all the largest municipal enterprises of the city. Artur Valiakhmetov, the chairman of the Committee for Economic Development, spoke today at the Business Monday about the possibilities of engaging energy-efficient technologies in the construction of new facilities, as well as in the housing, social and transport sectors. Artur Valiakhmetov said that energy saving measures in the housing stock allowed to get a result of 2.2 million gigacalories in the amount of 2.6 billion rubles just for thermal energy over the past 7 years. The growth of energy resources consumption occurs due to the introduction of new social facilities. Energy efficiency projects are being implemented at all the largest municipal enterprises of Kazan, including AO “Kazenergo”, MUP “Vodokanal”, MUP “Metroelectrotrans”. “Over the past 3 years, Kazenergo completed the reconstruction of 12 boiler houses. The total annual savings from this work amounted to 7.3 million rubles, and the loss of thermal energy as a result of the decommissioning of 100 central heat points and the installation of 1388 individual heat points at 1267 facilities decreased by 20-40%”, said the speaker. A. Valiakhmetov noted that energy saving in the field of construction is promoted by the interest of developers to green standards. For example, back in 2016, a building in the residential complex “Sovremennik” was the first in Russia to receive a “green award” and the highest class of energy efficiency according to the international method for assessing the environmental performance of buildings BREEAM. Each house in the residential complex “Manhattan” will be equipped with solar batteries. The residential complex “Z House” on Spartakovskaya Street claims for the first gold certificate of the Russian standard of environmental friendliness and energy efficiency GREEN ZOOM. The Urban business center on Ostrovsky Street is currently being tested in terms of object certification for an updated version of the international standard for improving energy efficiency LEED v4. The project claims to receive the GOLD level and will be the first object of this level in Tatarstan, marked the speaker. “It is important to understand that international standards reflect the requirements of the concept of sustainable development. For example, the LEED standard includes over 50 parameters that a building must meet. An understanding gradually emerges in the society that the observance of green standards is beneficial to all”, noted A. Valiakhmetov. 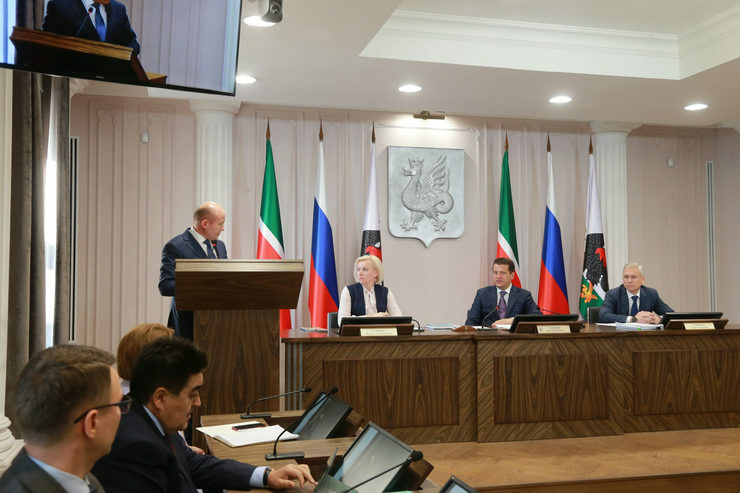 The republican program “Development of the gas motor fuel market for 2013–2023” is being implemented in the sphere of transport in Kazan. Last year 104 buses of this type have been purchased. The speaker pointed out that the main advantages of using gas engine fuel are a reduction in motor fuel costs, a reduction in harmful emissions and safety. “Today, energy-saving measures are included in all municipal programs of structures and enterprises”, marked A. Valiakhmetov. As an example, he cited a program for the overhaul of social facilities and convincing results for just one object. Thus, after the overhaul of the kindergarten №346 in 2017, the consumption of heating and electricity decreased by 10 and 12%, respectively. In 2018, in the territory of 16 settlements, 1400 LED lamps were installed in the framework of the outdoor lighting restoration program in the settlements of Tatarstan. Despite ongoing energy conservation measures in the city, there is still potential for savings. One of the mechanisms for attracting extra-budgetary sources is an energy service contract. “Its main advantage is that the city budget does not invest initial funds. The costs of the investor are reimbursed by the savings achieved as a result of them. We are now receiving new, modern, energy-efficient equipment, and savings in the city budget after the expiration of the contract term”, explained the chairman of the Kazan Committee of Economic Development. In modern conditions, the most effective is the replacement of external and internal lighting, as well as the installation of water-saving equipment. Thus, the Committee of Physical Culture and Sport was one of the first among municipal institutions that concluded a contract with the “Youth Sports School “Strela” (“Basko”). 764 lamps were replaced with LED ones. The results of the savings were already visible after the first month of using the new equipment. However, according to the calculations, the energy consumption for lighting should decrease by 2 times, said the speaker. He urged colleagues to join the analysis of electricity consumption at other social facilities and calculate the effectiveness of the use of contracts with their subsequent implementation. The Committee for External Improvement is also actively conducting this work. In total, there are about 82 thousand light points on the balance of the city, more than 13 thousand of them are energy saving ones. They have been installed only in the last four years. The second energy service contract was concluded for the modernization of street lighting. As a result, 6100 lamps were replaced and 30 control cabinets were installed. This will save about 20 million rubles. “Because of the imperfection of the regulatory framework, there were problems in concluding energy service contracts. But today the mechanisms are fixed, and this opens up new opportunities for us”, said Ilsur Metshin, the Mayor of Kazan. “Energy saving is our careful attitude to nature, environment, and future. Many of our enterprises, divisions of the Executive Committee, municipal unitary enterprises are very actively engaged in energy conservation. The numbers are impressive”, the head of the city estimated the work on energy saving. Artur Valiakhmetov also spoke about the experience of world cities in the energy saving industry. Of the global trends, he noted the use of technology “energy out of garbage”. In cities where waste sorting has reached a global scale, waste has become energy or is being used for recycling. The technology is widely used in Malmo (Sweden), Vienna (Austria), Singapore, and others. Sorting of garbage there has reached a universal scale, and garbage has become energy or used for recycling. “The use of such technologies is associated with a high level of consumer culture and environmental awareness of the population. All inhabitants of the most advanced cities of the world are accustomed to the efficient use of available resources from childhood. And we, too, should strive for this”, said A. Valiakhmetov. In this regard, one of the important tasks facing the city today is to increase the overall energy consumption culture. Various family holidays are aimed at this, including the All-Russian Energy Saving Festival “Vmeste Yarche” that took place in Gorky Park in 2018, explanatory work in the media, children's school and preschool institutions, and active social advertising. “We plan to involve the structural units of the Kazan Executive Committee to conduct energy-saving lessons in the schools of the city. The first such lessons will be this month”, said the speaker. He also took the initiative to hold contests and competitions aimed at shaping and strengthening ideas of efficient use of energy and resources. I. Metshin urged to pay special attention to the environmental education of schoolchildren. “We grew up in such a generation when we were taught to turn off the light when leaving a room. Clearly, this is the most elementary habit, every parent teaches this. But now we are faced with new tasks – separate garbage collection. In the world, environmental education has long been instilled. Europe has been living by these standards for a long time. If we want to live in a clean city, respect for tomorrow must be taught to our children. The hardest thing is to change ourselves, change the mentality of our people, re-educate them. Doing it through children is the best way”, said the Mayor. He instructed the heads of districts and heads of enterprises to include plans for energy saving and separate garbage collection in their reports.